A 22 GHz KaVA image of 4C +21.35. Credit: Lee et al., 2019. Using very-long-baseline-interferometry (VLBI), an international team of astronomers has conducted a kinematic study of a jet of the blazar 4C+21.35. The research, presented in a paper published April 5 on the arXiv pre-print repository, sheds more light on the nature of this quasar and its jet. Blazars are very compact quasars associated with supermassive black holes at the centers of active, giant elliptical galaxies. Based on their optical emission properties, astronomers divide blazars into two classes: flat-spectrum radio quasars (FSRQs) that feature prominent and broad optical emission lines, and BL Lacertae objects (BL Lacs), which do not. In general, blazars belong to a larger group of active galaxies that host active galactic nuclei (AGN), and their characteristic features are relativistic jets pointed almost exactly toward the Earth. However, the detailed mechanisms of ejection and collimation of jets are still poorly understood, and more studies of this phenomenon are required to improve our knowledge on the subject. At a redshift of 0.433, the blazar 4C+21.35, also known as PKS 1222+216, is a nearby very-high-energy (VHE) flat-spectrum radio quasar. Previous studies have revealed that the object exhibits super-luminal apparent jet motions with apparent speeds ranging from three to 25 times greater than the speed of light (c) at milliarcsecond scales. Observations of this source also detected three gamma-ray flares—two occured in 2010 and one in 2014. "Since 4C+21.35 shows ongoing vigorous γ-ray activity and blazars are famous for their fast variability, persistent and frequent monitoring of the source structure is essential. We therefore studied the kinematics of the jet of 4C+21.3 with bi-weekly radio interferometric mapping observations, providing an unprecedented density of data," the astronomers wrote in the paper. 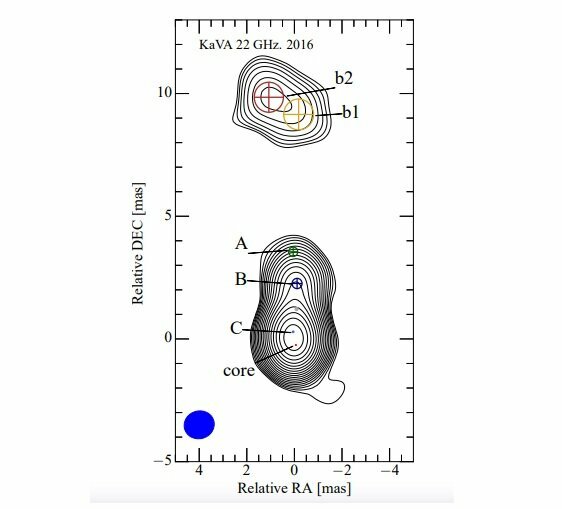 KaVA observations between mid-2014 and mid-2016 have revealed that at 22 GHz, 4C+21.35 has a compact straight jet, uncovering three components in the inner jet and two in the blob. All the jet components show linear outward motion—the further from the core, the faster they move, with apparent speeds reaching 14.4 c.
The researchers found a connection between the innermost component that became visible in early 2016 and the gamma-ray flare spotted in November 2014. They report that the timing of the ejection of the new component is consistent with this flare. "Extrapolating the position of the newly emerged component (component C in Figure1) back to zero distance from the core suggests an ejection in 2014.5 ± 3.4, assuming a constant component speed, consistent with the peak time of the mid-November 2014 γ-ray flare," the paper reads. Furthermore, KaVA observations at 43 GHz detected four inner jet components with apparent speeds from 3.5 to 6.8 c. However, when compared to the results from previous studies, the newly calculated apparent speeds turned out to be about 50 percent lower. According to the authors of the paper, this "loss of speed" could be a consequence of the fact that an AGN jet is not a group of discrete, point-like sources, but a complex continuous distribution of matter. They added that the discrepancy in the result could be also due temporal undersampling, which often leads to misidentification of components or overestimation of apparent jet speeds. All in all, the study highlights the importance of high cadence observations in order to avoid misunderstanding the jet kinematics.